At the launch of his appeal he said his conviction was based on "rumours". Bosnian Serb soldiers slaughtered nearly 8,000 Muslim men and boys in a "safe area" in Srebrenica protected by Dutch peacekeeping forces for the UN. Correspondents say Wednesday's ruling is likely to be one of the last remaining hearings stemming from the bloody break-up of the former Yugoslavia in the 1990s. In its original verdict, the UN tribunal ruled that Karadzic and other leaders were responsible for "organised and systematic pattern of crimes committed against Bosnian Muslims and Bosnian Croats". At the start of his appeal in April 2018, Karadzic's lawyer said the former leader wanted to overturn the conviction and was seeking a new trial. 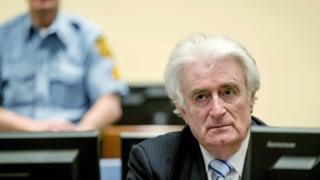 Karadzic told judges that the expulsion of Muslims and Croats in the 1990s had been "myths".